Date: 23rd – 24th June 2018. Cliff Pollan (pending) (CEO, Sococo). Amir Salihefendic (CEO & Founder, Doist). Sara Sutton Fell (Founder, Flexjobs & Remote.co). Justin Cooke (CMO, Empire Flippers). Liam Martin (Co-founder, Time Doctor). Eiji Han Shimizu (Mindfulness Coach). 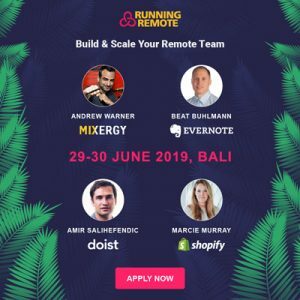 How does someone attend remotely, please?